As most genes are been renamed to align Xenopus with human genome nomenclature committee (HGNC) names, searching by an old name may not work. We do store alternate gene names, or synonyms, in the database and if it is there your search will find it. If it fails it means we don’t yet have that name in the database. Try the human, mouse or zebrafish gene name if you know them. 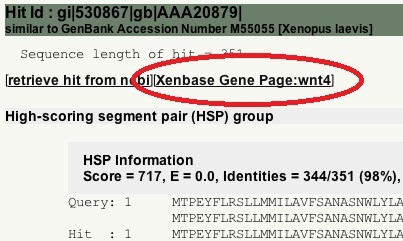 If this fails also, the ultimate gene finder is blasting the Xenbase database. Select “Blast Frogs” from the top left of the menu across the top of each page, paste in your sequence, select blast flavor and target (protein or mRNA) and click the "Submit Job" button. Blast returns have links to matching gene pages so you can jump straight to your gene. If you find a gene page matching an old gene name, and that name is not displayed as a synonym at the top of the page, you could do us and your colleagues a great favor by adding it--then next time somebody searches for that name they’ll find it. We also use synonyms to link to paper titles and abstracts and to figure legends, so adding one small synonym can result in a plethora of links to extra information. To add a synonym you need a Xenbase account, then select the link right next to the synonym field. Note how this page has 18 associated publications. Most of these were linked via synonyms and not via the new official name, wnt4. It will also allow us to link to your personal Xenbase page. We are running a contest for the users that add the most synonyms with the sweet Xenbase teeshirt as the prize. The search function is set to search all possible fields as the default. This means it looks in names, synonyms, orthologs--everywhere--which is why lots of genes can show up. Your search phrase is highlighted in the search returns to help you see why your search is finding so much stuff. To find fewer hits try using a more selective search term using the drop-down menu. We suggest you try "Gene symbol and synonyms" first. This will only search Xenopus names, both new HGNC style names and old legacy names (if we have them). It usually brings down the number to a reasonable scale. If it is still too many hits try selecting "Gene symbol", which will now miss synonyms but will be nice and restricted.